Candy Cane Wreath | Purchase Online | Free Shipping | 218.564.4909 |. Candy Cane shaped wreath is hand constructed of balsam, cedar and white pine, with white-tipped Ponderosa cones, red faux holly berries and a red velvet bow. Approximately 26″. Purchase a pair, (which face each other), to create a more festive look! To order the mirror version, please indicate in notes when placing your order. Order as many as you like! You’ll be given the option to separate the order to multiple shipping addresses to give as gifts! *Cones are subject to change based on seasonal availability. Included in the price for all US states except Alaska & Hawaii. Please call us at 218.564.4909 with questions. 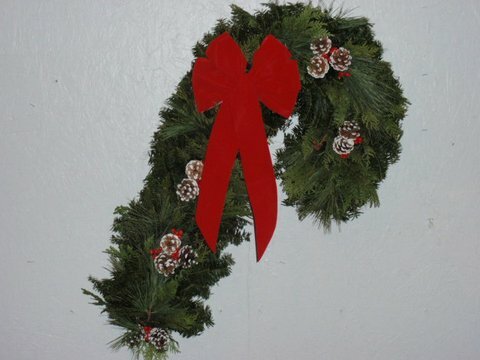 We have purchased wreaths from Greener Tomorrows for well over 10 years. We couldn't be happier with our purchases. The quality and freshness is the best anyone will find! We love sending "a piece of Minnesota" to my friends and family in Iowa. It makes them feel that we are all together for the holidays. We will continue to purchase from Greener Tomorrows for many years to come. Thanks for all your hard work. Attached is our wreath order for 2018. As you know, we love your wreaths and it's such a special gift for our friends and family each year. And for ourselves! We have ordered wreaths from you for 30+ years! Attached is our wreath order for 2018. As you know, we love your wreaths and it's such a special gift for our friends and family each year. And for ourselves! We have ordered wreaths from you for 30+ years! Our wreath arrived yesterday and now the Musser’s holiday begins. 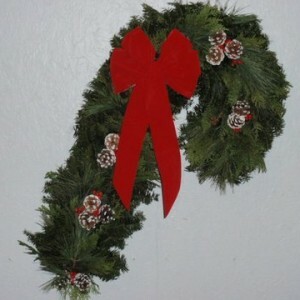 We love the quality and freshness of the wreath. My father, CT Richmond always ordered wreaths for family and friends at Greener Tomorrows. Between my father and Dan and me we have had a Greener Tomorrows wreath adorn our front door for over 30 years. Ever time time we walk by we smell the freshness and think of Minnesota summers. Thanks for the memories. You know that we can not kick off the holiday season here in Maryland without our Menahga wreath. Such a wonderful memory for us! I just wanted to send you a note of thanks for the beautiful wreaths you make every year for our family! My Mom and Dad started the tradition many years ago, and no matter where we lived, we got our little piece of MN through your wreath every Christmas. Now my parents' great-grandchildren even look forward to these lovely wreaths that smell like heaven, and Mom and Dad now get one on their grave. Thank you for being such a big part of our family Christmas tradition!